The best community in America sets the perfect stage for this attractive estate home built by Stock Custom Homes. Located in Pine Ridge, this home embraces the indoor/outdoor living opportunities that Naples presents through its sprawling lanai space, gracious living areas, and natural setting which encourages people to enjoy the private pond and large yard. Pine Ridge is a unique community with a combination of tranquility and city life. “This home is minutes from the beach, downtown Naples is just to the South, and the best shopping in town is literally right across the street. The location and the spacious and private lots, coupled with the local opportunities makes you feel like you have your own piece of paradise,” says Tony Spano, Associate Broker at Olde Naples Real Estate. “Pine Ridge was also named The Best Community in the United States by ATTOM, so this home really is spectacular all the way around.” Offered at $3,695,000, this four bedroom, five bathroom home is a fantastic example of what Naples has to offer. As you turn into the Euro-cobble paver driveway, this wonderful home with West Indies flair is surrounded by gorgeous landscaping and a lush natural setting. The outdoor living possibilities offered here are immediately apparent as you take in the scenery. The balanced architecture is accented by details like the louvered shutters above the windows and the corner beams add visual interest. A three car garage and golf cart garage with Clopay insulated doors and Liftmaster openers are also featured. In addition, the garage is outfitted with an epoxy floor coating for extra protection and durability. The cement tiles and stucco exterior will perfectly weather the heat and rain that Southwest Florida homes endure. These finishes provide a low-maintenance exterior for peace of mind. Up the silver travertine steps and entry, custom iron and glass double doors with Emtek handles lead into the home’s well-appointed open concept living areas. Sold fully furnished, the home’s tranquil setting is mimicked inside the home through neutral colors and natural finishes. The elegant design from award-winning Soco Interiors is enhanced by vaulted ceilings with tongue and groove details above the great room. A custom built-in entertainment unit with one-of-a-kind cabinetry provides a beautiful focal point for the great room. With plenty of seating, this room is the perfect space for entertaining and is conveniently located just off the large chef’s kitchen. Designer lighting illuminates the home and four-inch LED recessed can lighting can be found throughout. 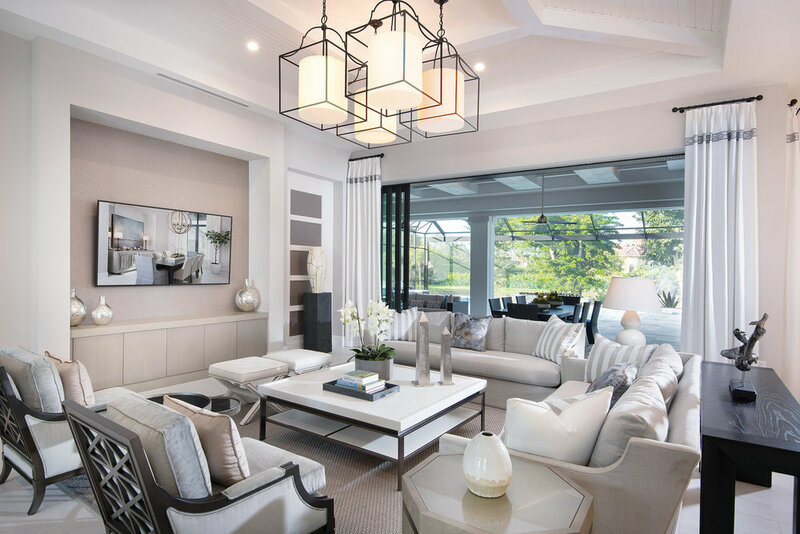 Attention to detail, like the use of linear diffusers, help create a thoughtfully and beautifully executed residence. The large kitchen featuring custom cabinetry provides plenty of storage and is finished with a matching hood and designer hardware. The expanded island offers ample counter space for cooking or homework along with wrap around seating. The cabinetry under the island is also usable storage. Quartz countertops and a decorative brick-like tile backsplash helps tie the outdoor and indoor kitchen together. Appliances like the gas cooktop, built-in wall oven, and the 42-inch built-in refrigerator, make this both a functional and attractive gourmet kitchen. Just off the kitchen is a comfortable breakfast nook that opens into the large lanai via the corner glass doors that fully pocket away for a true indoor/outdoor dining experience. The study, topped with a coffered beam ceiling and crown molding, is a quiet place to read or accomplish some work. Elegant built-ins provide plenty of attractive storage space, and a cleverly designed desk allows for multiple workstations. On the opposite wall, a wet bar with room for a wine reserve reminds you that it’s always five o’clock somewhere. The spacious master suite offers a private sitting area which opens to the outdoors. Coffered ceiling details, the warm wood flooring, neutral colors, and soft textures provide a luxurious feel and serene setting. The free-standing soaking tub and tile and glass accent wall is the focal point in the master bath. Behind the walk-in shower, there are dual seats, modern shower features, and decorative tile accents. His and hers matching vanities, topped with large quartz counters, feature custom framed mirrors and sconce lighting. The crown jewel of the home is the spacious outdoor living area. “This is why people move to Naples; they want to enjoy the mild winter temperatures and healthy outdoor lifestyle,” says Spano. “This home is a great place to launch your outdoor activities.” The lanai offers a full dining room, seating area, and a large outdoor kitchen with bar stools for easy outdoor entertaining. Even outside, ceiling details are present, and accent tile surrounds the fireplace wall and is mirrored across the lanai behind the outdoor kitchen. Naturekast cabinets and granite countertops provide a weather-resistant finish for the outdoor kitchen. Silver travertine tiles anchor the lanai and motorized storm shutters can be rolled down when needed. The pool uses less chlorine thanks to a salt water generator system. The raised spa and sun shelf are accented by the modern fire feature. The panoramic panels for the screen enclosure create an unobstructed view of the yard and private pond with spectacular water fountain. Thanks to the 1.5-acre lot which provides plenty of lawn space, an outdoor fire pit sits just beyond the screen enclosure. This is the perfect spot to roast marshmallows on the occasionally cold Florida winter night, while the water feature provides relaxing ambient noise. This listing courtesy of Stock Realty, LLC for $3,695,000. For more information about this home, or to schedule a showing, please call 239.216.9507.